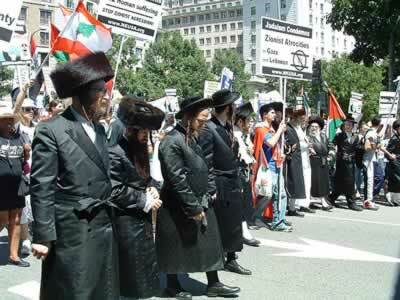 Interestingly, there’s a group out there called “Orthodox Jews United Against Zionism“. (Thanks to Dave M. for the link.) Their rationale seems to vary, but among their arguments is the belief that the Torah teaches them not to be political, thus seeking a Jewish homeland is not acceptable behaviour. Mind you… isn’t protesting against Zionism also a political act? Hmmm. Complicated. Regardless, I thought I’d share this with you. Always remember: the WS is owned by a prominent member of the Conservative party, and its contributors include prominent supporters of the party. What does it say about the party when this is the kind of people and the kind of intellectual activity it seems to produce and attract in more than just trace amounts. Also unrelated, but sort of related, is this clip of George Galloway giving it to the US House of Representatives. As I said before, George is a blowhard and a weasel at times, but other times I’m glad he’s around, ’cause few others have the cajones to tell it like he does. Previous PostMore FlufferyNext PostBush is not a Nazi, so stop saying that.